Garmin eTrex data fields – what have you got? I have an eTrex 20 and I’m trying (not for the first time) to rationalise its operation. which pages you have added to Main Menu > Setup > Page Sequence (i.e. the screens that are cycled through when you repeatedly press the Back button). … and of course anything else you feel like telling us about your decisions. For example, I like leaving the device on the Satellite page when I’m walking with it, so that accidental operation of the joystick does nothing (but with this thread I’m interested in cycling use). I understand your preferred data fields may change from time to time, but I’m curious what people have found useful. Re: Garmin eTrex data fields – what have you got? I use the map page with speed and clock time showing. I don't feel the need for much other information. Mainly used for randonneuring/audax purposes. Some of those choices are probably a little arbitrary, but I don't think I've ever wished for much else. Don't use any of the other views. 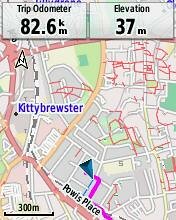 Next Point and Distance to Next on the map page. As you can see I can't really find a good use for more than about 6 fields. Also shows battery, time and GPS signal at the top of the page. Three pages on my 20: map, data, list of tracks. Speed and distance on the map page. Data page largely as found. Many thanks for the contributions, all. Does your bicycle convert into a sailplane, Pingu? Just have these as separate screens which I scroll through with the back button. How does the satellite page stop any accidental joystick 'damage', I sometimes remove the unit off the bars to go in cafes etc and if I put in a pocket it can go a bit weird, don't like to turn it off as it affects the overall average speed. Any joystick input has no effect on the Satellite page. Since these devices don’t have a way to lock the screen, so to speak, that can be useful – especially in a pocket. You can go to the Satellite page from the Main Menu, of course, but I like having it available from the Back button since I use this function often. Also, who doesn’t like seeing all the satellites and their position in the sky? The magic of GPS never gets old for me. You’re also a sailplane pilot, JonB? Some stuff on the data screen that I almost never pay attention to, but moving and overall average speed and total ascent certainly feature. 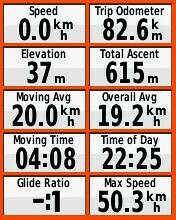 I have overall average speed and stopped time on the data fields, randonneuring for the purposes of. All sorts of stuff on the data page, though no glide ratio. Not sure about page sequence, nor can I remember which "profile" it's set to. e20. I was a bit confused by this comment here and above for Pingu but it's just sunk in ... glide ratio! Not sure if you've got this in the 20 as it doesn't have the barometer but it gives an old school of version of incline (1 in 10 = 10% etc, apologies if you actually know this). It gives the decline, so a 10% incline shows as -10:1. Funny - I was going to say the reverse, as that single big data field is a useful way of getting 'Next point' up to a legible size, and 2 of the other 3 'fixed' items displayed are ones I have anyway (time and GPS signal strength) so very little is lost by it. 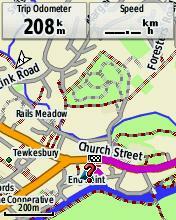 Easy to store alternative layouts by using the 'Profiles' feature of the GPS. I'm pretty sure the 20 also has glide ratio. Will check soon. The eTrex 20 does indeed have the Glide Ratio field. The mental gymnastics of converting that into something familar, such as per cent gradient, would be too much for me, I think. Besides, the gradient isn’t all that interesting to me. What is more interesting is vertical speed. The eTrex has a Vertical Speed field too, but the units are not the familiar metres per hour of VAM. Metres per minute is the closest option, I think. Maybe I’ll try that, though who knows if it’s accurate enough to be useful on an eTrex 20. The eTrex 30 would fare better here.